ix, 256 p. : ill. (some col.) ; 26 cm. "Well-illustrated general survey describes the historic architecture of the area constructed before WWII. Organizes architectural examples according to building types: residences, military facilities, public and institutional buildings, and religious buildings. Short introductory chapters and brief descriptions take into consideration influential factors such as geography, climate, early Amerindian occupation, European and African immigration, emancipation, and immigration from Asia"--Handbook of Latin American Studies, v. 58. Includes bibliographical references (p. 249) and index. 1. Architecture-West Indies. 2. Historic buildings-West Indies. Florida, University of South Florida, and University of West Florida. Color plates follow page n8. tried to choose examples that represent the general architecture on the island. structed before World War II. Africa, emancipation, and immigration from Asia. influence is unique to the U.S. Virgin Islands, formerly the Danish West Indies. by islands, in each chapter. of the small islands in the Lesser Antilles defines the eastern boundary. The Lesser Antilles also have geographical subdivisions that have been named. off the coast of northwest Venezuela. far west of Portugal between the Canary Islands and the southeast coast of Asia. the fabled land of Antillia. by Marco Polo a century earlier. presented unique demands for shelter and comfort requirements. nial examples until thirty years or more later. building types never made the shift. the various Asian indentured laborers and their descendants. onized by the same European country. 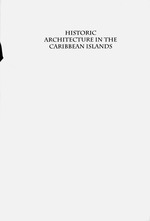 Wood was the predominant building material in the early colonial Caribbean. sistance to earthquakes became apparent. because of the many common parameters that shaped the architecture. boney (or Ciboney) migrated from Florida to the West Indies. (now Haiti and the Dominican Republic). initial visits to Dominica, Marie Galante, Guadeloupe, Montserrat, Antigua, St.
turned to Spain by way of Hispaniola and Puerto Rico. H p S a u .Lt. Z. THE EARLY. ..-: .. \ ... U .
; i ...t ... .
the British government in 1903.
times arranged around ball courts. east of Spanish Town, Jamaica, where considerable excavation has been done. feet five inches from the center. administration of private enterprise, organized into joint-stock companies. accommodated the courthouse and the parish church. When Columbus visited Jamaica in 1494 on his second voyage, he named it St.
the island to St. Jago de la Vega. from the unity of the original layout. lots around the square had all been acquired by the most influential citizens. the public in 1872, the year that Kingston became the capital ofJamaica. church were important planned ingredients in this English village green concept. sand beaches and the sulphur fumes still evident around Brimstone Hill. Fig. 19. Plan of Basseterre, St. Kitts. the French were required to leave. cathedral, the Courthouse, and numerous residences faced onto the square. behind a primarily residential square. French in 1666, it has remained British ever since. SI : ......... ANTIGUA : ,. " building in St. John's is its Anglican cathedral, located on a prominent hilltop. has been strong, and most of the inhabitants have been Roman Catholic. St.
,. : *i. .. .. .
island and provides a valued building material. erected before its London counterpart. umph, the British won it for good. turned on their sides for caulking and repair. The irregular coastline and hilly terrain contribute to a chaotic street pattern. the ridge or go through Sendall Tunnel, a ten-foot-wide passage dug in 1894.
buildings also frequently have wrought-iron balconies that are French in style. .I n MIN. A'. .
1802, when Trinidad was ceded to Britain. Chac6n, deflected the river from its original position, leaving a dry gully. ting onto which a number of significant buildings face. ground in the West Indies. (Arawak) name for the Bahamian island that Columbus renamed San Salvador. dral, Fort Nassau, and 160 houses. i i j ,......i ._ : L..c .
newly independent United States to the Bahamas. north created space for Rawson Square in front of the Public Buildings. south to East Hill Street. Bennet's Hill that provided the limestone for many of Nassau's early buildings. around 1793 by slaves, the steps were later named in honor of Queen Victoria. pattern was faithfully adhered to from the sixteenth to the nineteenth centuries. island at that time, but by 1580 they had practically disappeared. one built by Spain in the New World that remains basically intact. nial governments. It eventually became an impediment to the city's growth. treaty in which Spain relinquished claims to Cuba. an impressive urban space with a shady park surrounded by significant buildings. its original function was to muffle the sounds of military traffic. was classified as a world heritage site by UNESCO. a prominent location and public buildings surrounding a central square. claimed by Spain at that time. buildings are located and in which are placed monuments to the country's heroes. France; the French named this section St. Domingue. and independent nation, and the name Haiti was substituted for the French St.
until his death in 1820.
stroyed many of its buildings of architectural value. with the narrow streets of the old section. Caribbean market (see plate 5). sugar, coffee, cocoa, and indigo. and its 30,000 inhabitants. Existing ruins attest to the force of this disaster. *r y ~ ~ I' ,, P.l, i .
zl !.' r ... .
--;! .fr rir 8 ! statue of Empress Josephine, who was Martiniquan. separated by a narrow channel. cipal buildings, including a Center for Arts and Culture. The island owes its name to the day Columbus sailed into it, St. Martin's Day. only minor clashes, for almost 350 years. colored buildings, attractive shops, and flower-bedecked streets. Sint Maarten Dutch side "
lands, this time in accordance with the Treaty of Paris in 1816.
vation of the Dutch settlers. most active slave centers in the Caribbean. structure was reworked in metal in 1939.
for it the title "Amsterdam in Miniature." to settle on St. Thomas in 1657 and the Danes in 1666. The British occupied St.
a similar effect on the plantations. tecting the approaches to the Panama Canal. veloped as extended pedestrian staircases, and so they have remained. park offers a pavilion for concerts and other entertainment. Fig. 75. Waterfront Park, Christiansted, St. Croix, U.S.V.I. pleasant arcades over the sidewalks, providing good protection from sun and rain. in vogue at that time is apparent in many of the replacement buildings. required a large estate and a well-equipped factory to make cultivation profitable. itable, and some were as large as 3,000 acres. driven around in a continuous trot as the cane was fed into the rollers. I. -,, .., ,-. .
shells of this type of mill exist all over the Caribbean, attesting to its popularity. power sources to be in use at a single plantation. Fig. 85. Whim Plantation animal mill, St. Croix, U.S.V.I. Fig. 86. Whim Plantation windmill, St. Croix, U.S.V.I. began to replace the great house. The restoration at Whim Plantation, near Frederiksted in St. Croix, U.S.
and windmill, St. Croix, U.S.V.I. ceased its sugar mill operation in the 1920s. Its great house will be discussed later. areas, number of rooms, and so on, to determine the category. "Small residence"
includes the most basic huts, chattel houses, one-story cottages, and bungalows. ence, as no antecedent is found in England or elsewhere in northern Europe. entered the United States via New Orleans. varied considerably from place to place. the slaves were familiar because of its wide use in West Africa. was sometimes used for both roof and walls. 6o within the building allowed the development of a closer relationship to the land. not owned by the occupant. construction was extremely useful, for it could be dismantled and moved easily. mortar. The latter mixture was preferred, as it was more durable than clay. type of construction during the Spanish era. work." Nog construction was not restricted to the small residence. shaped veranda to wrap around the three sides of the front room of the house. variation occurred in the design of the veranda railing and in the fascia fretwork. space below also occur in Basseterre. iron hip roof, and windows with solid shutters. enlarged by adding another similar module on an axis perpendicular to the street. Still others were added as needed. louvered for ventilation and had transoms above them. Island, remote from Nassau, and the villages were similar to African settlements. roofs. Some of the small frame houses were elevated for ventilation. gable roofs are covered with wood or asphalt shingles or with corrugated iron. RESIDENCE ters, and a gable roof. mands. Clay tile, available locally, was used on the hip, gable, or gabled-hip roofs. The most modest urban dwellings were wood frame with horizontal siding. Doors were usually solid, although they sometimes had louvers for ventilation. small residences have used stuccoed masonry. tional outlet for the designer's exuberance. building techniques traditionally provided the joinery for these wood structures. houses. Closure at the openings was accomplished by solid or louvered shutters. important considerations in the Guadeloupe residence (see plate 10). peted gables, tile roofs, and dormers gave these a Dutch flavor (see plate 11). were closed with solid wood shutters. Small residences of this description are still scattered throughout the U.S.
idential architecture fall in this category. cornices, were taken from pattern books produced in England. for privacy. Adam-style detailing was used extensively on the interior. removed at that time, exposing the original red brick and white stone quoins. The lower level now houses a restaurant. of Georgian, with a rectangular plan and a formal and symmetrical front facade. front elevation has jalousies in combination with sliding-sash windows. the-century waterfront homes built on High Street by well-to-do merchants. quoins, and flat arches at the windows. double-hung windows have louvered shutters. heritage. Stone quoins occur at its corners. teresting townhouses, Lynton and Carlisle View, on Bay Street in Bridgetown. parapets" and are reputed to provide protection to the roof during high winds. and at the windows on the sides of the house. double stair to a landing, then a single stair to the entrance portico (see plate 13). concave curves of the Barbadian parapet. iron balconies attest to the persistence of the French tradition. of sedan chairs was accomplished by leaving the porches open on either side. cresting and pinnacles. Brown went back to Scotland in 1921. Chinese pavilion is included in one of the projecting galleries. ical of many Trinidad residences. The two symmetrical projecting "bay window"
fireplace and domed brick oven. The outhouse known as the "Slaves' Quarters"
has, on its north and west elevations, loopholes in lieu of windows. have been taken from a ship. There are a number of outbuildings on the property. building instead of on the street side. yards, where family activities took place. doorways lead into the residence. constructed their homes around lushly planted central patios. room in the House of the Arabs serves as Havana's only mosque. porches. The low-sloping roofs are covered with red tile. medium-sized residences were constructed here at that time. which led to a land surplus. Tostado House now houses a museum. are frequently embellished with Spanish Renaissance details. quently brick nog, with complicated placement of the half-timber elements. upper balconies, and solid shutters are provided to cover all openings.